Wearing: Saks Potts jacket, Gestuz dress, Cala Jade hat, Paco Rabanne bag, Zara boots and Glitter earrings. Some thoughts; A new years resolution for me should defiantly be to update this blog more. Another one I will try to do is to make YouTube videos, which is a huge challenge for me. I am going to finish my bachelors degree in media, and I am going to travel a lot. 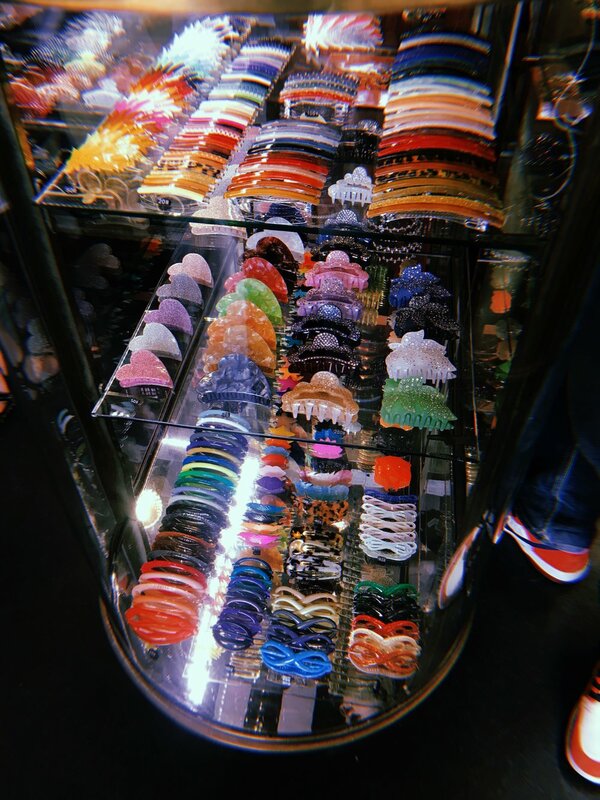 Shop all the jewelry and hairpins here. It is no secret that I use a lot of accessories. I find them to be the perfect way to make a look more interesting, and it does not have to be very expensive. Christmas and New Years calls for an crazy amount of bling. Personally I really love to just stack it up, and go all out. If you have no idea of what to wear to any holiday occasion, just glam up an old dress with some fun jewelry and accessories. In this first look I have added 8 hairpins to one side of my hair. Notice that the star hairpin matches the star earrings. I also added 7-8 rings to my hands, my favorite is the one on my thumb. All of the bling is from Glitter. Keeping my bling safe in here. Here you can see all of my favorite picks from Glitter. A huge trend for 2018 has been resin earrings, they give a kind of vintage feel to any look. Resin (harpiks in Norwegian) is the perfect way to go if you are not a huge fan of rhinestones or any other more sparkly bling. Shop resin earrings here. Adding a hairband can really change up your look, it almost makes your look seem more winter appropriate. Another favorite of mine are these real silver and freshwater pearl earrings, find them here. Freshwater pearls have been a huge trend in 2018, and it will continue into 2019. I have multiple earrings with freshwater and baroque pearls, but they can be quite pricey. These ones are real and only cost 399 nok, which is such a good price. They are honestly the perfect christmas gift. I have always loved H&M designer collaborations, they make designs more affordable and easier to get a hold of. Each time a designer collaboration drops I get this obsession about at least buying one item from the collection, as a collectors piece. Because that is what the items truly are! 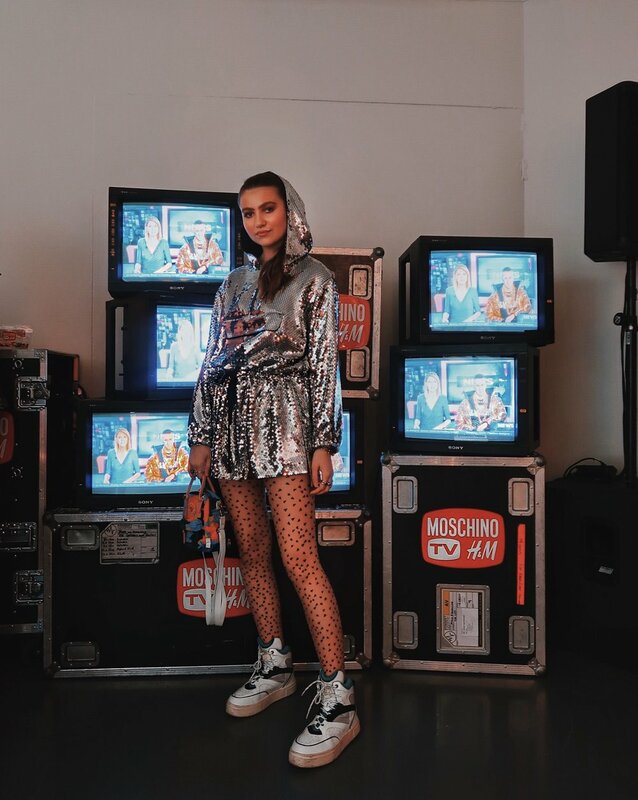 At the launch party in Oslo for the H&M x Moschino collection, I was lucky enough to get to wear my favorite piece from the collection, this sequin dress. I decided to style it with some retro tights from Wolford, my trusty sneakers from Eytys and my current favorite bag from the Acne Studios x Fjällreven collab. The place where the event was held was fully decorated in true Moschino spirit, and mini bags with colorful skittles were handed out. We also got the opportunity to buy the collection before it launches on Thursday. I left only with the phone cover but I am tempted to get a hold of some more fun pieces. The collection may seem a bit too crazy at first glance, but it is important to see each piece for itself. Some of my other favorites were the black and gold padlock bag, the classic Moschino belt of course, the rhinestone bra (!!) and at last the puffer jacket and skirt. Wearing Acne Studios blazer, FWSS t-shirt, Isabel Marant jeans, Balenciaga sneakers and Truss bag. 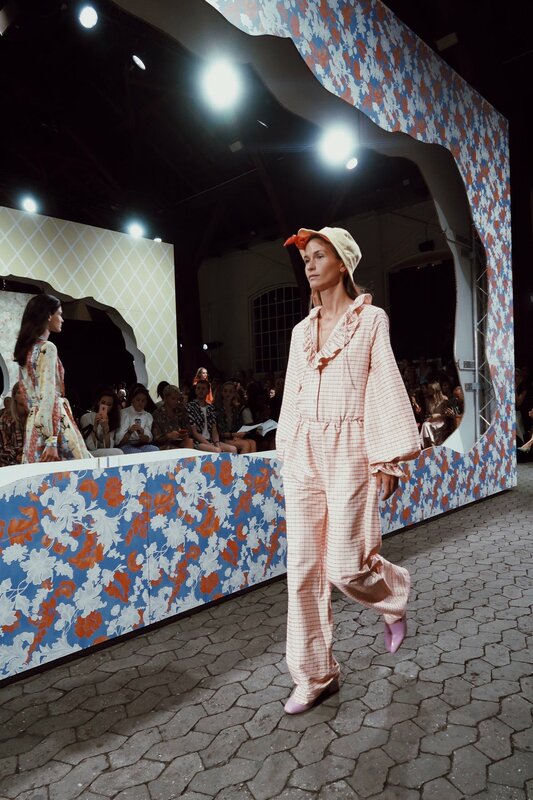 The first show of Copenhagen Fashion Week was Birgitte Herskind, which was held at the Nimb Hotel rooftop. She showcased some amazing showpiece bathing suits and matched them with cowboy hats and boots. I need every piece of swimwear from this collection right now! The next show was Blanche. We got to see familiar silhouettes with fun twists in classic colors. After Blanche, I ran over to the next show which was the Mykke Hofmann presentation. After that me and some friends sat down at Sticks’n’Sushi for a quick bite. My favorite is the Pink Alaska, which is salmon with philadelphia. Wearing Moiré cape/skirt, Zara top, FWSS trousers, Reebok sneakers, Cala Jade bag and Weekday hat. Like a kid in a candy store! 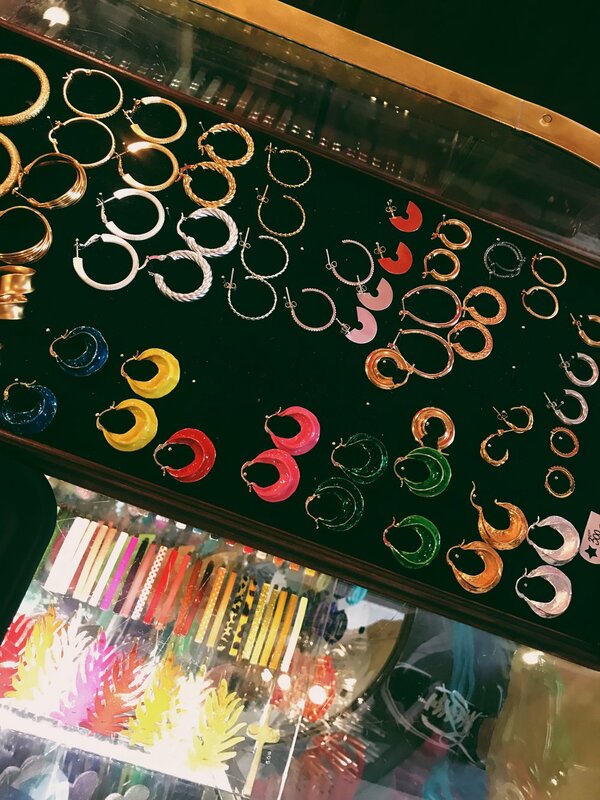 Deeply regretting not purchasing more earrings here, but I went for the red hoops in the photo to the right. After some quick shopping it was time to head over to Résumé. The show was inspired by Clueless, and I loved it! The colors and the patterns are so me. The location was fun as well. Wearing Résumé dress, Marc Jacobs hat, Isabel Marant belt, Cala Jade bag and Dr.Martens boots. The next day started with breakfast at Atelier September with Andrea, Dina and Silje. We then jumped in a cab and headed over to the J.Lindeberg show. The collection was sporty, but at the same time classic with a twist. My favorite look was the classic suit, where the pants were cut to knee length and combined with high socks and chunky sneakers. We then went to the Morten Ussing show which was beautiful as always. 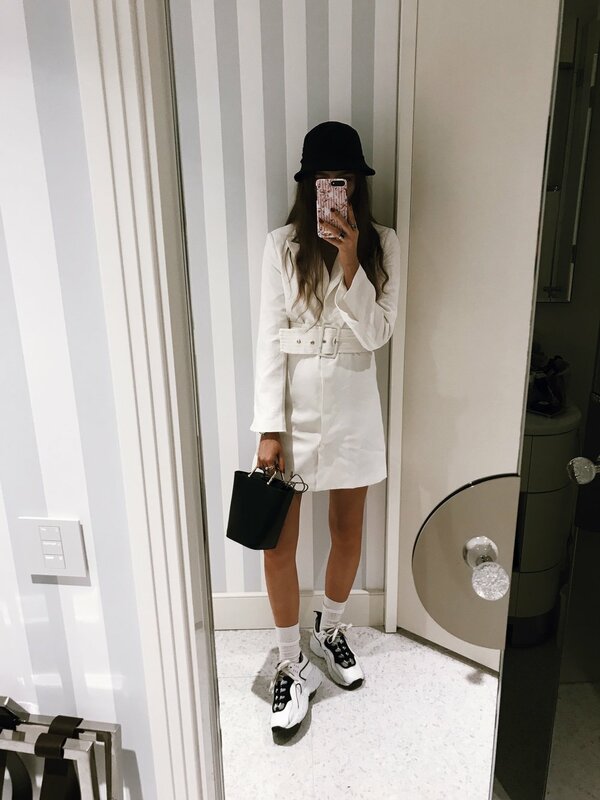 Wearing: Epilogue dress, Brixton hat, Paco Rabanne bag, Balenciaga sneakers and Isabel Marant belt. After a quick change we drove out to the Holzweiler show, which actually is a Norwegian brand. The location was so nice, and the collection really represented Norway in a good way! The following show was Stine Goya, who is one of my favorite designers. I was so lucky to be seated front row, so I got to really see the collection up close. Captured is one of my favorite looks, it is soo me! 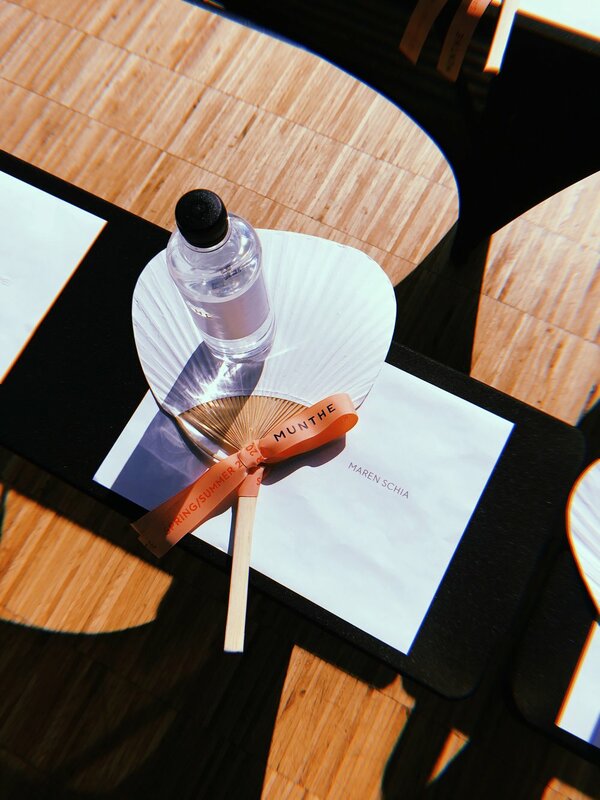 After the Stine Goya show, we went home to freshen up before heading to the Glossier event. We were so fortunate to be gifted some of the Glossier products that have been such a big hype lately, and I must say that I have used the lip balm everyday since. After Glossier, me and Rune went to the Samsøe Samsøe dinner, which was so much fun. 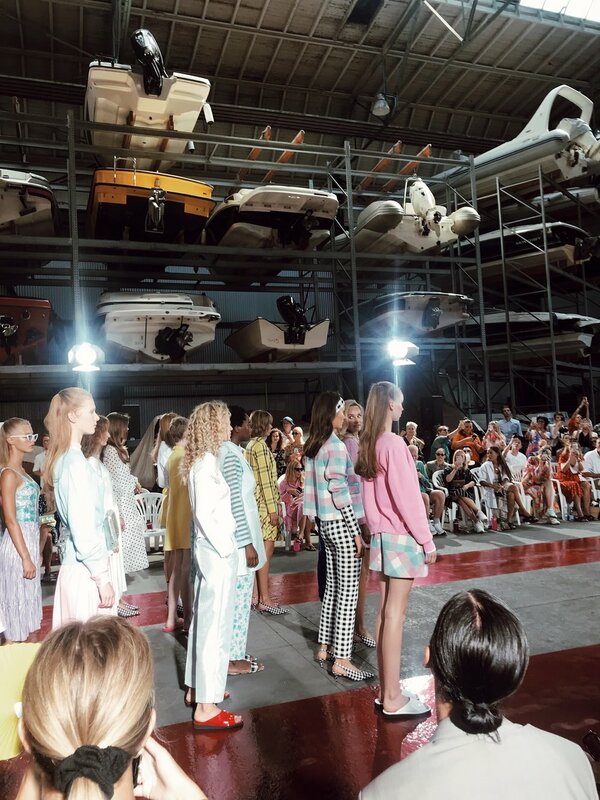 The next day started with Hofmann Copenhagen, and it turned out to be one of the best shows during fashion week. The styling was incredible, and they played with prints in such a fun and cool way. I need to get me some sports glasses asap. 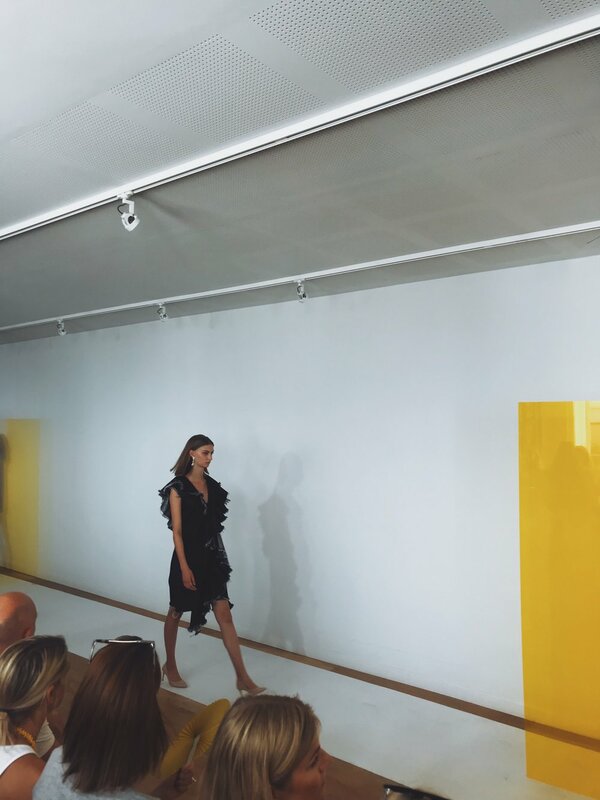 Following up was the Munthe show, and right after that the By Malene Birger show. Wearing: FWSS t-shirt and skirt, Reebok sneakers, Calvin Klein Jeans bag and Asos hat. Then it was time for Designers Remix, and after that was Lovechild 1979. We then headed out to the off schedule show called “Brøgger” which was really inspiring and colorful. 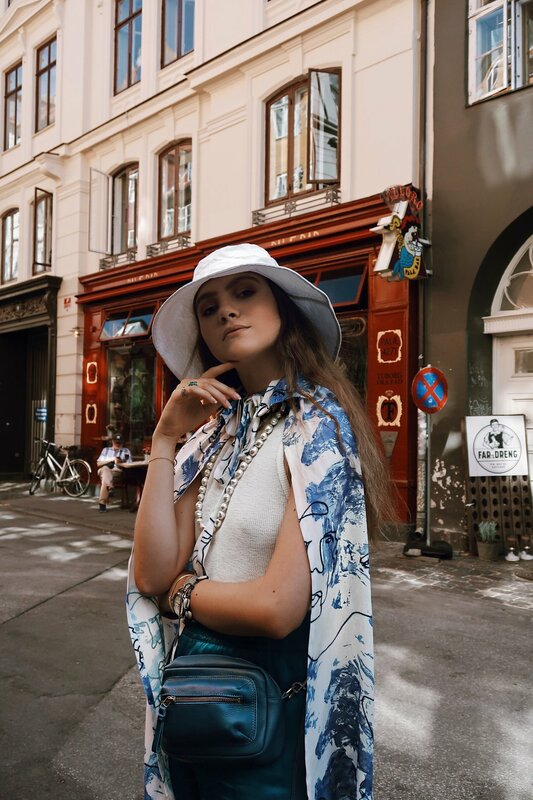 Unfortunately I didn’t take any photos there, but you can see a clip in my Youtube video from Copenhagen Fashion Week at the bottom of this post. Wearing: Acne blazer, Ganni dress, Balenziaga sneakers, Truss bag and Céline sunglasses. Then it was time for the show that I was most excited to see, Ganni. I love how Ganni is becoming more and more edgy. The show was so cool featuring some classic rock songs and an amazing location. The mountain boots is one of the biggest trends this season, and it seems like it will last until the next season as well. After the Ganni show, I went back to the hotel for a quick change and then out to dinner with some of my friends. We had the best nachos at Café Norden before heading to the last show of Cphfw, Saks Potts. Another outfit from my trip to Palma de Mallorca. Me and my sister decided to take the bus in to town and eat dinner there. We shared two amazing pasta dishes, and after that we just enjoyed the buzzing city. Wearing: Ganni dress, Zara bag, Nelly shoes, Glitter earrings & Mango necklace. Another one of my outfits that I wore in Palma while I was there. This one I wore when we were going to an Italian restaurant in the city centre. I have always found crop tops to be hard to style. Sometimes they can be just too much.. This one is quite "edgy" in its color and pattern, but since it shows quite a lot of skin, I decided to combine it with a midi skirt to balance it out. I also put on some tennis shoes to ease down the quite feminine look. Wearing: Top from Ganni, skirt by Gestuz, vintage handbag, socks from Lindex & sneakers by Nelly. When going on holiday, there is a few highly important essentials that one needs to bring, in order to be able to relax. Especially if one is going on a beach holiday. There is nothing worse then forgetting sunscreen as an example. A holiday filled with sunburns and staying in the shadow, is not a pleasant one if you ask me. That is why I brought some of my current favorite products to use in the sun on my holiday to Palma. 1. Zara beachbag - Bought this in Palma. It's incredibly light which makes it perfect to stuff with beach essentials. It's not big enough to hold a towel, but all other stuff you would want to bring to the beach will fit. I love the colors, and that you can wear it both to the beach and when going to the city for some shopping. 2. Replay sandals - The comfiest sandals I brought to Palma. Not only is the color super amazing, but the fit is perfect and the leather is so soft. The design is also a little bit different to any sandal I have ever seen before, which is great because with such a light shoe, it's hard to stand out design wise. Wearing: Bathingsuit by Bikbok, bag by Zara, sunglasses from Sunbuddies, silk scarf from Sandro and necklace by Mango. 3. Biotherm Crème Solaire spf 30 - I used this every single day on my face in Palma, and I didn't break out once, which one can tend to do with sunscreen. It soaks quickly into the skin, leaving it fresh and plump. 4. Guerlain Terracotta Sun Protect spf 30 - I used this one completely up on my trip. Not only is the scent amazing, but it's so light on the skin and I do really love the idea of a tan enhancer in a sunscreen. I would prefer if the tube was a little bit bigger, so one wouldn't have to bring multiple bottles when going on a two week holiday for example. 5. Guerlain Terracotta Rêve d'Eté - This is a "skin tint" of some sorts, that gives your skin a fresh summer tanned look without covering anything up. This also contains the tan enhancer which is why I used it under the Biotherm sunscreen every day. I also mixed this into my foundation during the evenings, to make it lighter on the skin and darker in color. 6. Decléor Aroma Sun Expert Protective Hydrating Milk spa 30 - Another spf 30 that I brought with me on my trip. This one is also super light and soaks quickly into the skin, so one could say that it does what it promises (as in the hydrating milk part). One thing I prefer with this one is that a small amount goes a long way. This one looks barely touched, but I used the Guerlain one up completely on my 10-days long trip. I love those spontaneous summer nights. Those were you just tell your friend "Hey let´s go there and do this". Summer really creates the opportunity for new memories, without any limitations. I now have had vacation since the 8th of May, and It´s starting to sink in that I really don't have any more exams, any more deadlines hanging over my shoulders and making me stressed out. Until fall that is. Now I can finally enjoy life a little, and feel like I'm free. I can go on restaurants with my boyfriend, I can go shopping with friends, I can travel with my sister and I can focus on my Instagram and blog which is something I really, really enjoy doing. Wearing: H&M blazer, Lindex knitted tee and sunglasses, By Malene Birger shorts, Paco Rabanne bag, Acne sneakers and Glitter hairpieces. 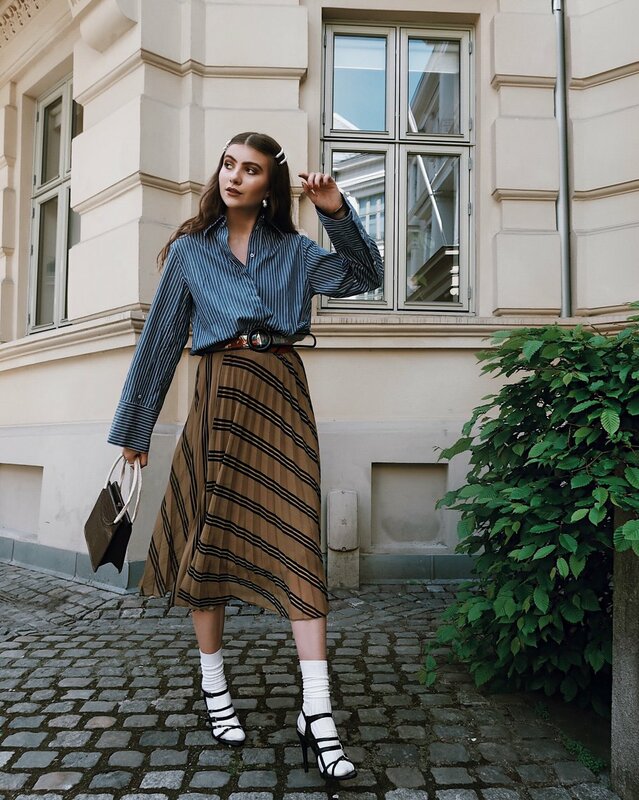 Wearing: & Other Stories shirt, By Malene Birger skirt, Zara belt, bag and shoes, Glitter hair accessories and Lindex sunglasses. Wearing: Nelly denim jacket, Dagmar skirt, Paco Rabanne bag, Bianco sneakers, Des Bonbons hairclip. Wearing: Julie Josephine shirt, Norr shorts, Zara belt, Céline sunglasses, Calvin Klein Jeans bag, Gestuz shoes and Glitter hair accessories. Me and Andrea went out to take some photos this Sunday and stumbled upon this Magnolia tree which I have never actually seen here in Norway. It was truly stunning, and smelled divine. It was also the perfect photo location... hehe. The photos turned out to be some of my favorite photos I have ever "created". I love how my red outfit clashes with the pink flowers. Wearing: Marc Jacobs hat, Lindex bag, Bikbok dress, H&M blazer, Comme Des Garçons tee and Acne sneakers. Woke up at 03:00 in my apartment in Oslo to get ready to catch the bus down to the city centre, to meet up with the other travelers. At 05:00 I was finally on the bus to the airport, next stop; Stockholm. When we landed in Stockholm, we checked in to the Nelly Charter airplane, with destination Nice. The plane was of course all decked out with the Nelly Charter logo which made this trip even more surreal for me..
Decided to travel comfy and cute, and went for my trusty Acne Studios Manhattan sneakers, a straw hat from Lindex and a straw bag from Chêne. The clothes are all from Nelly, you can find the pants here, the shirt here and the blazer is sold out.. At 15:00 we finally arrived to the secret destination, which turned out to be the Palais Bulles. I have been wanting to go here ever since Dior showed their cruise collection at this location in 2016. The place is truly unique and breathtaking. If you ever get the chance to go there, I will highly recommend it. Especially for the great Instagram photo opportunities.. haha. Then it was finally time for lunch, after a long day of traveling. I changed into my new dotted jumpsuit from Nelly which you can find here. I tucked in the "sleeves" and covered the cleavage with a scarf to make the jumpsuit more edgy. I paired it with these amazing kitten heels from Nelly, which looks so much more expensive then they were! You can find them here. Lastly, I threw on my Adax bumbag, my Monki sunglasses and my trusty Zara belt which literally goes with all of my looks. Then it was time for lunch. We were served a Hawaiian poke bowl with coconut marinated salmon, avocado, edamame and a bunch of other delicious ingredients. It was so so tasty. After lunch it was time to head back to Cannes to check in to our hotel. 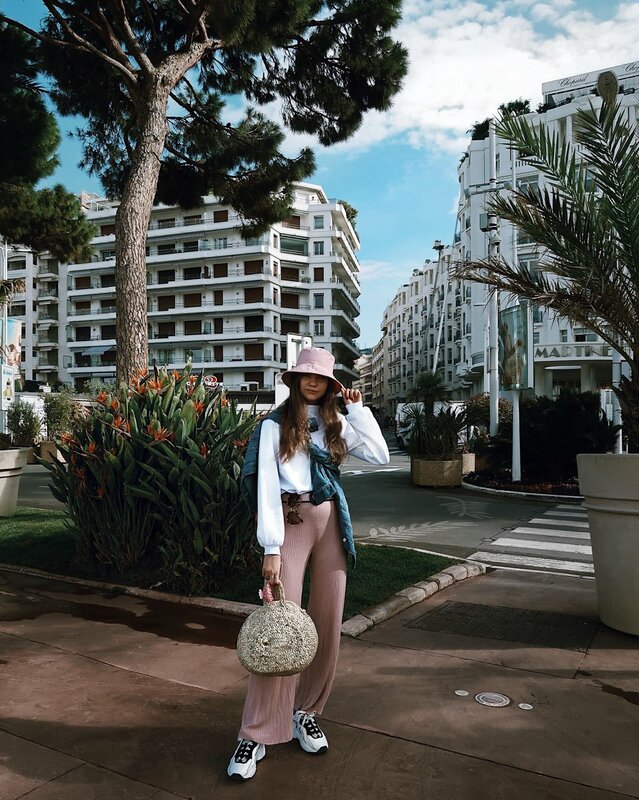 We checked into Hotel Martinez at the Croisette in Cannes. Such a stunning hotel! We had to hurry up and get ready to go back to the Palais Bulles, because we were to have dinner and drinks there as well. We were served this amazing fish with a cheese covered rice or something.. haha it was so tasty. We also had some chocolaty dessert before heading to the dance floor. My chosen attire for the evening was this belted dress from Nelly which you can find here. Paired it up with my Acne sneakers once again, my Acne bucket hat and an & Other Stories handbag. The next morning I woke up at 07:45, and went down for some petit déjeuner before check-out at 09:00. Then it was time to head back to the airport to fly to Stockholm, and then to Oslo. For my airport attire on the way home I wore my COS bucket hat, my Zara belt once more and the Acne sneakers (which I am pretty sure you are tired of hearing about now?). All of the clothes are from Nelly.com. You can find the sweater here, the pants here, the denim jacket here and the sunglasses here. Thank you for this amazing trip Nelly.com! I am so so grateful that I got to experience the South of France for the first time with you guys. Advertisement - In collaboration with Zalando. Fashion without limits; Something I really strive after, and encourage people to think about. It's possible to express yourself through clothing, and that is something I have always believed in. The Me Unlimited campaign is all about being unafraid of fashion. You can check out the campaign here. My task was to put together an outfit that was my version of casual elegance, which honestly describes my everyday style perfectly. I chose a tailored pant, a classic jacket and a simple bag as my elegant inputs to this outfit. Then to soften the look up, and make it more casual and my style, I decided to combine it with some bright yellow sneakers, a sporty top and a bucket hat. I also added some star shaped hoops, that made the look more playful. 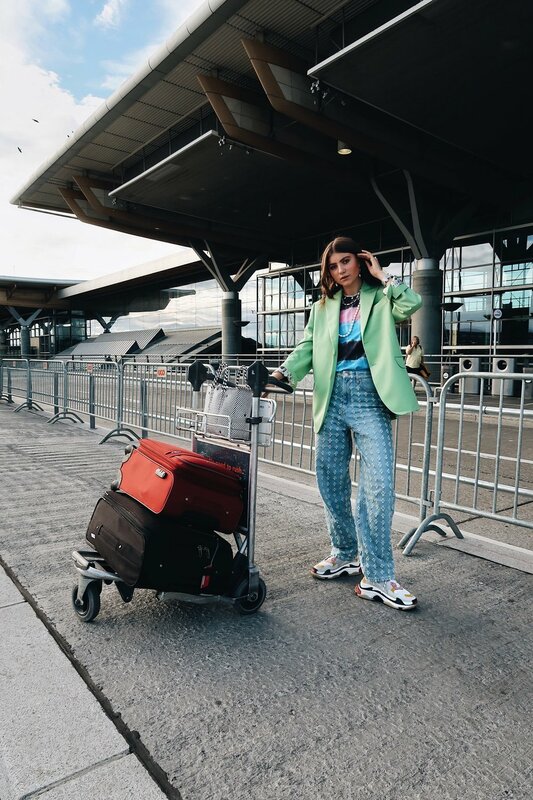 Wearing: Bruuns Bazaar jacket (link), Ellesse top (link), Filippa K pants (link), Calvin Klein Jeans bag (link) and shoes (link) and Orelia hoops (link). About 1-2 years ago, you could only see me wearing black, white and grey. I don't really know why I did that, but I just really liked having a minimalistic style. These days I am much more comfortable with color and almost wear colorful outfits every single day. It was quite a process going from neutural to color. If you are thinking about adding more color into your wardrobe I highly recommend taking one step at a time, adding pieces of color slowly. Maybe start with some colorful shoes or a bag, even a cute blouse? And remember, colorful pieces can be classic too! My intention wasn't really to take up this subject in this post, but oh well.. The other day, I kind of had a blast form the past.. Clothing wise. I decided to dress up in black and white from head to toe, which I never do anymore. I also went a little bit out of my comfort zone and put on some white tights, and I loved it! I combined the white tights with my new Acne Studios Manhattan sneakers, and my new coat and bag from the H&M Studio Collection. I topped it off with my trusty old Acne Studios beanie which I got on sale in January. Really one of the best purchases I have done lately. I can't wait for spring to come, so I can wear this coat open with a dress or a pair of blue denim jeans underneath it. Also, I was supposed to save these sneakers for spring and summer, but if you know me, you know I just couldn't resist taking them out of my closet. Wearing: H&M Studio coat and bag, Acne Studios beanie and sneakers, Lindex tights and Triwa watch. 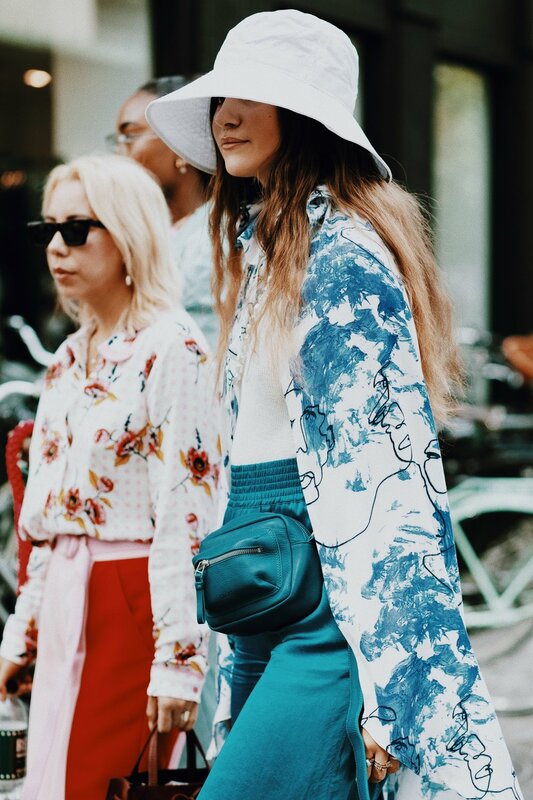 Finally time to write to you about Copenhagen Fashion Week. It was my first time attending, which ment that I had to do a lot of work before I could actually go there. In the end I managed to get invited to 20 shows! 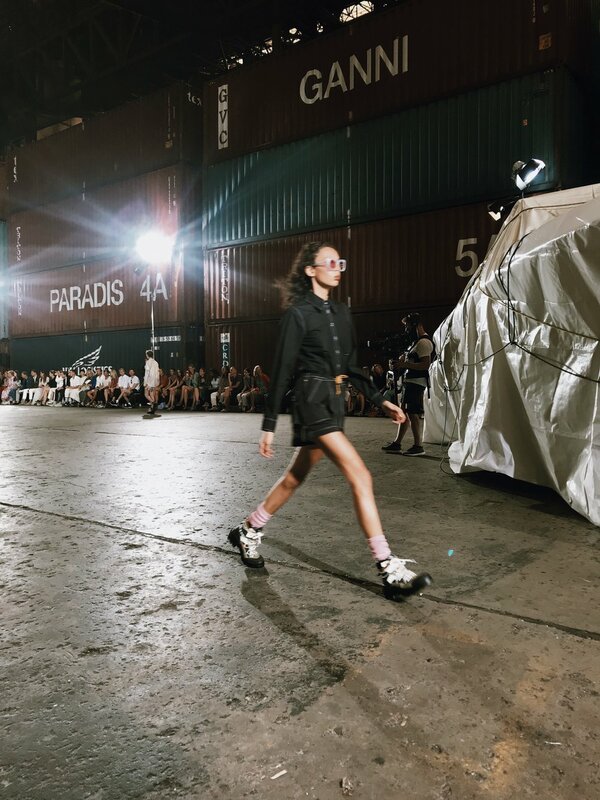 But, since Copenhagen Fashion Week is so big, and the distances between the shows were quite long, I didn't manage to make it there on time to all of the shows.. Arriving to Copenhagen was such a dream. Imagine leaving from -6 celsius and snow in Norway to plus 6 degrees celsius in Copenhagen with no snow under our feet! It really felt like spring. 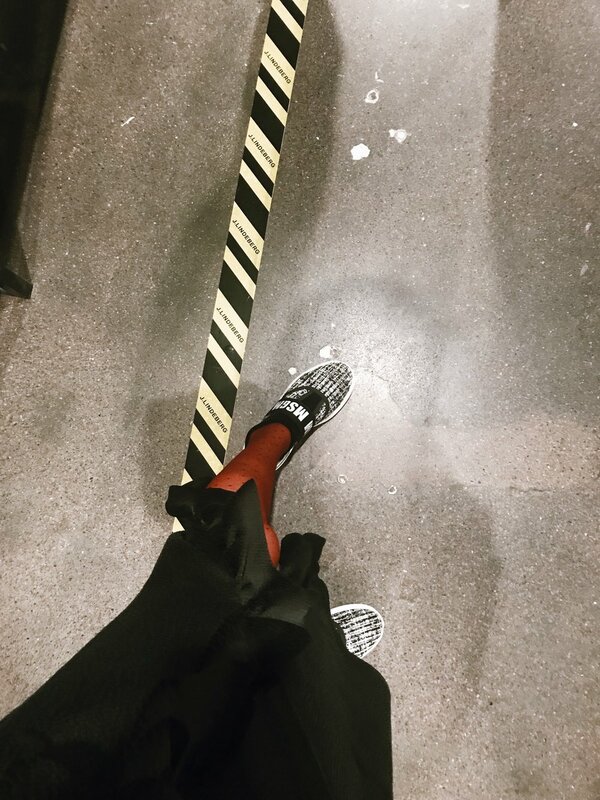 We went and checked into out hotel, before we had to hurry to the first show which was Blanche; an up-and-coming brand that makes interesting basics with sporty details. We were really hungry after the show, because we had not eaten since the airport in Oslo. We decided to go to Café Norden which is quite a touristy place but they have the best nachos ever! Just look at the photo below, my mouth is watering just by thinking of eating that right now. After we finished the nachos, we decided to walk to the next show, which took like 30-40 minutes.. It was very exhausting, but also refreshing to get some "exercise" into our day. After the Oh! by Kopenhagen Fur show, we went to dinner with our friends Julie and Sonia, were we had delicious authentic italian pizza. Then we went to sleep.. The next day started of with us checking out of the hotel, and into Skt. Petri which was the official fashion week hotel. We checked into a beautiful suite which included a bedroom, a living room, a bathroom and a separate toilet. It was so nice to have a big space for our belongings, since it was in fact fashion week, and we were three staying in the room. Just imagine the mess, with everyone changing multiple times a day into different outfits. Right after check-in we had to rush over to the first show of the day which was the J.Lindeberg show. It was a really sporty collection, mainly consisting of black and white clothing, but also surprising colors like blue, orange and yellow. Wearing: H&M blouse, Rodebjer dress, Acne Studios beanie, H&M tights, Just Female bag and MSGM shoes. After the J.Lindeberg show, I was supposed to go to the Martin Asbjørn show, but we didn't manage to grab a taxi quick enough so we missed the show.. We drove back to the hotel, before I headed over to the Anne Vest show. She showcased a lot of colorful fur jackets with interesting details. Unfortunately I only took videos and no photos.. After the Anne Vest show, I went back to the hotel to change, before we got in a cab to try to make it to the Freya Dalsjø show. Wearing: By Malene Birger pants and blazer, Marimekko shirt, Decadent bag, Komono sunglasses and H&M earrings. The Freya Dalsjø show was defiantly the show I was most excited to see during Copenhagen Fashion Week. I love her take on tailoring, making it super edgy and cool! Next show up was the By Malene Birger presentation. I really adore By Malene Birger, and I constantly wear her pieces. The black suit I wore for the show, had a green shimmery sheen to it, making it an interesting take on tailoring, which I do think both Freya Dalsjø and By Malene Birger have in common. The last two shows of the day ended up being Holzweiler and Bitte Kai Rand for us. Holzweiler really represented the Norwegian culture in their show with warm coats and hats, accessorized with snow boots and backpacks. After the Bitte Kai Rand show, we headed back to out hotel where we got ready to go to an event, but decided last minute that we would rather eat McDonalds and relax. As one do during fashion week, or maybe its only us? haha. Day 2 of Oslo Runway started of with the Veronica B. Vallenes show which was held at the National Museum here in Oslo. We got to see a lot of tailored silhouettes with interesting details. My favorite look from the show is the on under here featuring a shirt with an extremely long collar, a beautiful leather skirt and black trousers. Me and my friend Andrea outside of the show. Wearing: Isabel Marant coat, H&M blouse, Lindex sunglasses, H&M trousers, & Other Stories bad and Nike sneakers. The next show we went to was actually a presentation by the accessories brand Cala Jade. It was held at the beautiful Vigeland museum which features a lot of sculptures of human bodies. The models was standing on podiums acting as a part of the museum collection, showcasing the new handbags. I really like the direction Cala Jade is heading towards. The bags featured interesting prints in surprising colors as well as the most amazing acrylic chain I have ever seen on a bag! Really really cool actually. You can see this chain on the blue bag that one of the models is wearing over her shoulders. Next up was Elisabeth Stray Pedersen which is always a favorite of mine. She held her show at her new factory at Økern here in Oslo. This gave the show a more raw feel to it, making me feel like the clothes was tailored perfectly to the models right before they came out. She showcased the most amazing wool coats and jackets in quite boxy shapes and some in surprising colors. I defiantly need all of them. Almost all of the models wore white tights which I have been loving lately to wear myself, as well as some amazing clear boots that I need in my life asap, where can I get them? Anyone? Next show for me was supposed to be Admir Batlak, but I missed it which I am so so sad about.. I had to go straight from ESP to a styling event hosted by Redken, Adam&Eva, Oslo Runway and Maud & Fram. It was the first time in a very long time that someone had fixed and styled my hair. Fun fact: I actually can't do anything with my hair, I am soo horrible at hairstyling that I barely can put it in a ponytail. So let's just say that it was really nice to have someone style it. I actually got to borrow some clothes from Maud that were being showed later that evening. I picked out an amazing checked coat, some flared trousers and a white blouse. I styled it over an H&M blouse that I was already wearing before I got to the event. Then we went to the Maud & Fram show which was held at Christiania theater. After that, we headed to Grand Café to eat dinner with the same people and brands that hosted the styling event. All in all, a perfect end to Oslo Runway. Before I start writing about day one of Oslo Runway, I just have to write a tiny bit about Costume Awards that was the night before. Decided to go there very last minute and had to throw together an outfit super quickly. Actually bought the blouse I was wearing this same day on sale at Acne! Had been eyeing it for soo long, so when it was on 60% I just had to get it. For those of you that don't know what Costume Awards is, it's an award show honoring the people in the fashion and beauty industry in Norway. Costume is one of the biggest fashion magazines here in Norway, who are hosting the show. It really is a great place to meet new people in the industry, so I am so glad I decided to go. Wearing: Acne blouse, H&M blouse underneath, Zara pants, & Other Stories bag, MSGM via Zalando shoes and H&M hoops. Then it was time for Oslo Runway. Our fashion week here in Norway is called Oslo Runway, and this year it lasted from the 26th of January to the 28th of January. The first day started of with the Michael Olestad show, which was held at the beautiful "Kunstnernes hus", directly translated to the house of the artists. It was a fantastic show with live music and interesting tailoring. Some of the models even had money bills attached to their jewelry which was quite a fun detail. Next show up was Iben, which is a show I am always looking forward to during fashion week. Before we went inside, we took some photos outside of our outfits. These two photos of me and Nina under here are taken by Emil Jarengrim (@streetstylebyemil). Wearing: Komono sunglasses, Isabel Marant Etoile windbreaker, Iben trousers, & Other Stories bag and Doc Martens shoes. The show was held at Grünerløkka here in Oslo. I personally think that this location was one of the best during Oslo Runway, it really had an international feel over it. On the runway, we saw a lot of orange, denim, wool, corduroy and checked patterns. The styling was, as always, on point. Left photo: Filippa Hägg, me, Nina Sandbech, Tess Hell and Katarina Petrovic. Next show up was supposed to be Line of Oslo for me, but unfortunately our taxi driver didn't find the location, so we missed the show.. So while people were inside looking at the show, we were outside taking outfit photos again haha. Wearing: Lindex sunglasses, H&M hoops, Marimekko shirt, Stand collar, H&M coat, Line of Oslo jeans, Decadent bag, Lindex tights and Veja sneakers. The next show was By Timo, which is a show I always look forward to. Elisa, one of the girls from By Timo, is the most kind person I have met in this industry. As always, By Timo showed gorgeous dresses, but this time with some more edgy details like a sharp collar, a low waisted beaded skirt (which I would gladly be married in) and pattern mixing. I wore a By Timo dress to the show, but to make it more my style, I styled it with colored tights, sneakers, a fun bag and a beanie. Wearing: Acne beanie, By Timo dress, Marimekko bag and Nike sneakers. With me on the photo, also in By Timo is Filippa Hägg. The next and last shows were Tom Wood and FWSS. I didn't really get to see that much from the Tom Wood show, since I stood quite far behind in the crowd. It was filled with denim as usual, but this year the added interesting takes on corduroy and purple. FWSS really surprised me actually. I feel like they are becoming more and more edgy. They showed the most amazing checked coat/dress that I need to get when it comes out. We also saw a lot of beautiful silky pieces, all styled with sneakers or winter boots. I also have to mention the sneakers that are made in collaboration with Diemme.. They are so soo good! Defiantly worth to take a look at. Wearing: Acne beanie, & Other Stories jacket, Iben skirt, Weekday jeans, & Other Stories bag and Nike sneakers. Day 2 of Stockholm Fashion Week started off at a breakfast event with Reschia shoes in the beautiful Lydmar hotel. The suite where the event was held, was the most gorgeous hotel room I have ever been in! The interior was just how I would love to have my own apartment look like, with fishbone floors, vintage rugs, designer furniture and amazing art. Wearing: Stand jacket, Monki dress, Lindex tights, Decadent bag and Veja sneakers. After the Reschia event, we decided to go shopping since we had some time on our hands. As I have expressed earlier on this blog, I love love love & Other Stories, so of course we went in there to have a look. Found myself some amazing jeans, a wide-sleeved shirt, a pair of glitter socks and the most amazing round bag which you will get a look at later in this post. Also went into Zara for a quick look through the selection there, and found some some super cool checked pants that I will get lots of use out of. After our little shopping spree, we sat down at Wienercaféet, which is a cute little place to eat some swedish pastries and drink some coffee. Then it was time for shows again. First off was Swedish Fashion Talents which I must say was one of the most interesting shows! Particularly one brand called Rave Review who use materials from secondhand clothing to make new great creations. Right after that show, we went directly to the Stand show, who showed fun jackets and coats as usual. Later that day, Reschia hosted another event at the Lydmar Hotel. We had lots of fun getting to know other people in the industry. For the event, I decided to change outfits into my newest purchases. We then attended the Whyred show, which was one of my favorites. They showed the most amazing wide denim pants, some super cool dresses and an outstanding mens collection. Wearing: & Other Stories shirt and bag, Zara pants, Asos patent coat and Nike sneakers. After the Whyred show, we took a taxi to Tako where we had booked a table. Tako is an asian fusion restaurant which is my favorite type of restaurant. I had tempura shrimp and tuna sushi with jalapeño and a tiny egg. 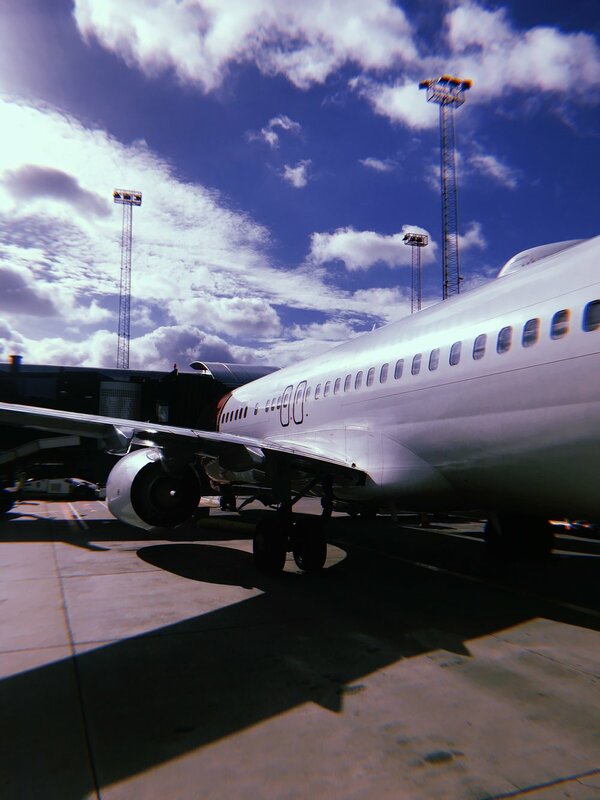 Our flight was scheduled to leave on the third day of Stockholm Fashion Week, so we did not have a lot of time to go to shows, but we managed to see some. The first show of the day was Naim Josefi, following that we had to check out of our hotel, then grab a quick lunch. We then headed to a meeting with Vass PR in Stockholm before we had to run to the Stylein show. After that we headed to the airport where our flight was delayed for two hours..
That was it for my first time at Stockholm Fashion Week. Next up is Oslo Fashion Week (or Oslo Runway as we call it in Norway) and Copenhagen Fashion Week. Let me know if you want to know more about Fashion Week and my experiences around it! 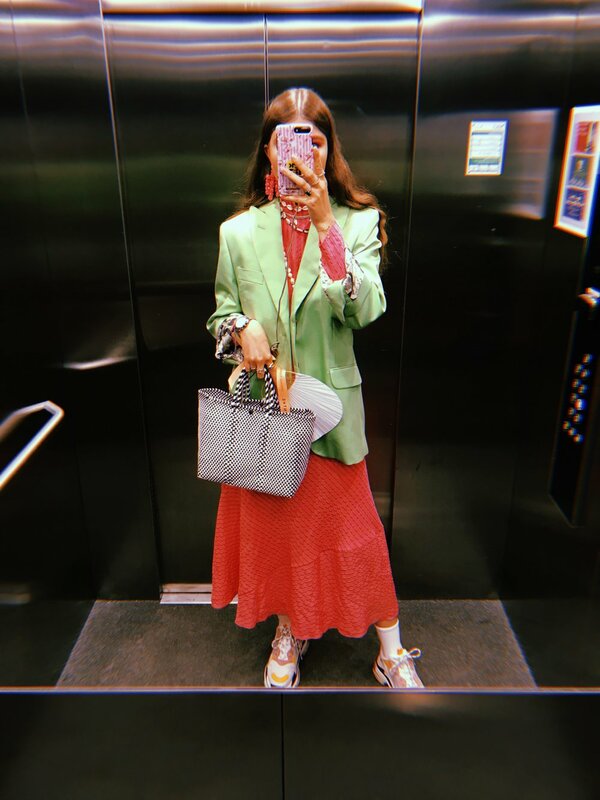 Wearing: Lovechild 1979 blazer, Gina Tricot blouse, Glitter earrings, Sunbuddies sunglasses, Finery London pants, & Other Stories bag and Veja shoes. Long time no see, I suppose I should say. This last month has been super crazy and busy, that I just have not found the time to sit down and produce blog-content that I will be happy about. 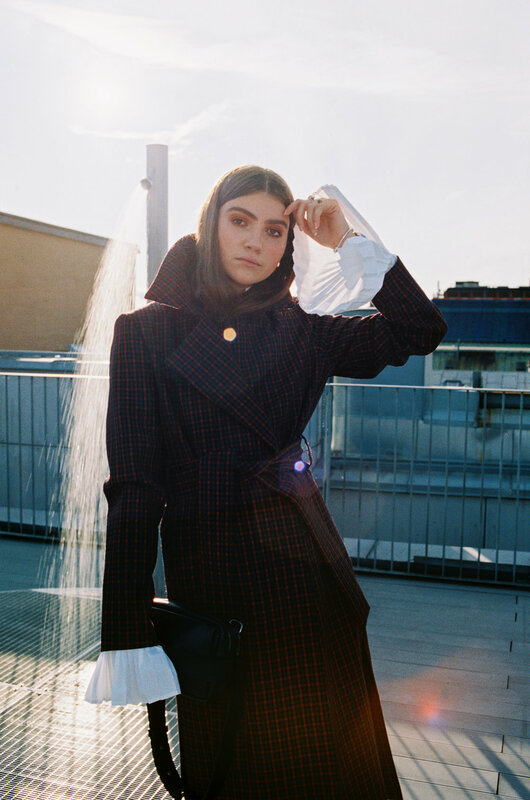 Just one week after I started on my fourth semester at the University, I sat myself on a plane heading to Stockholm for Fashion Week. It is my first time attending any fashion week outside of Norway, so it was really a huge jump for me. Not only did it take a lot of e-mailing back and forth to get into any shows, but it also needed a lot of planning hence why I did not manage to blog very often in January. I was in Stockholm from the 21st of January to the 23rd. We arrived early in the morning to be able to catch the first opening shows. On the photo above, you can see me and Nnennas airport outfits. We decided to stay super comfy and casual, both wearing big warm jackets, super cozy pants and sneakers. Wearing: Isabel Marant coat, Diemme long sleeve, Second Female pants, MSGM via Zalando sneakers and ATP Atelier bucket bag. We checked in at Comfort Hotel Xpress Stockholm (Sponsored stay), which is perfect if you want a cheap but also a central hotel in Stockholm. 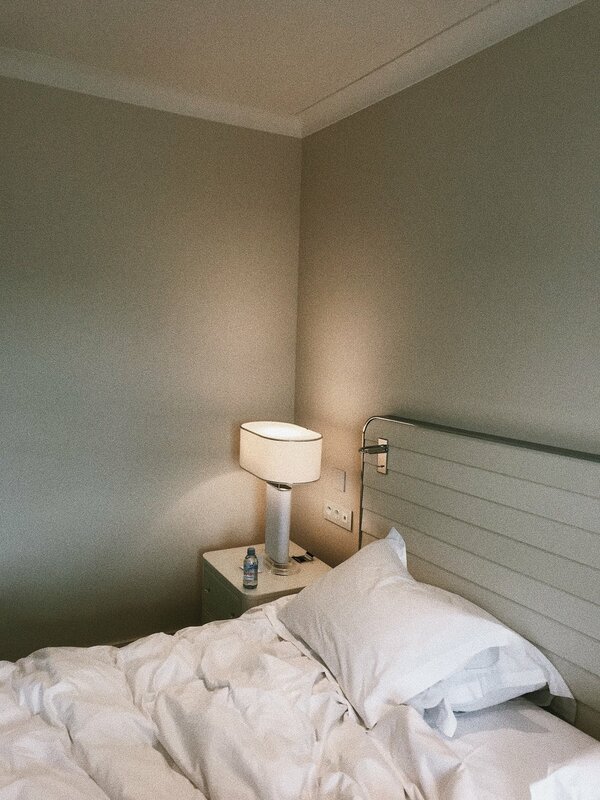 During fashion weeks, we do not really spend any time at the hotel, because there is always something happening, so we only need a place to change clothing and sleep. Photo on the left by Joanna Totolici for Vogue.com. Wearing: Ganni knit, Iben skirt, H&M tights, ATP Atelier bag, Komono sunglasses and Nike sneakers. Started the day of at the Beckmans College of Design show, which was students showing their work. I think it is really interesting to see new and upcoming designers display their work, however I feel like for most design students these days it has become harder and harder to stand out from the crowd, and that really impacts their design. Instead of making something wearable, its all about making crazy and extravagant pieces that no-one can possibly wear. Hopefully these students made what they really wanted to make. The next show I went to was Johannes Adele and after that we visited the Glitter lounge at Grand Hotel, which was the most gorgeous suite with pink floors and cute jewelry all around. On this day, we had brunch at Riche, which is the perfect spot to sit down in between shows. I have written about Riche in my "An Instagrammes Guide to: Stockholm" previously. I went for the eggs benedict, which tasted really delicious. After a rather quick lunch, we had to hurry back to the Grand Hotel where most of the shows were held, to watch Newhouse, followed by Busnel before heading to the Filippa K show. Ended the day at Max hamburger, because you know... it's fashion week haha. Fair isle knitwear is huge this season, we have seen it both at Loewe and Fendi, and every big fashion blogger on Instagram. This knitted sweater from Isabel Marant looks like a christmas sweater to the man in the street, and the perfect statement for every fashion enthusiast. With glittery threads going through some parts of the sweater, it can be used on an everyday basis or to parties. I decided to style it with some brown corduroy pants from H&M, which I have gotten tons of use out of this season. Corduroy makes the perfect contrast to the knitwear. For accessories I went fore som pointy boots from Isabel Marant, some big sunnies and silver earrings with green stones to compliment the attire. Wearing: Isabel Marant Etoile sweater, Isabel Marant boots, H&M pants and sunglasses and Carré earrings.